Fearless Eating may receive commissions from purchases made through links in this article. As an Amazon Associate I earn from qualifying purchases. More info here. It was during a 10-day vipassana meditation retreat where I first experienced the power of eating mindfully. Day after day of sitting for long hours in silent meditation taught me to bring my attention to not just my breath, but to all activities, including, of course, eating. I was able to put down the fork with ease. I can’t overstate how powerful an experience this can be. That being said, eating mindfully is not easy and our crazy, fast-paced, distraction-filled culture does not support it. Admittedly, I don’t practice it very well outside of the supportive environment of meditation centers. More often than not, I find myself eating in front of the TV or my computer. At that is the very essence of mindless eating. Sadly, this is how most of us eat today. In fact, few people even know what it means to eat mindfully! People define it differently but to me, the essence of mindful eating is all about HOW you’re eating. And that means paying attention to what your eating. Imagine being in a conversation with someone but not really listening to what they’re saying. You may be physically present, but your attention is elsewhere. Most of us do this with food as well. So paying attention to what you’re eating means becoming aware of the physical sensations of eating in the present moment – the smell, taste and texture of food – as well as the associated emotional sensations. Because without awareness of the physical sensations, emotions tend to drive how we eat. Of course, we’ve all experienced emotional eating at some level. We eat out of boredom or to cope with stress or for entertainment or to cover up emotional pain. For many this can lead to chronic overeating, food addictions and intense sugar cravings. And those things can lead to physical symptoms, especially digestive problems. As you may know, there is huge connection between gut health and stress. Long story short, stress whacks out our digestive tract. And this is where dietary changes are not always enough. Certainly a gut-healing diet is essential. One must remove offending foods like sugar and grains and bring in gut-healing foods like nutrient-rich bone stocks and fermented foods. But for many people with chronic stress, this is not always easy. Emotional eating and intense cravings can easily overwhelm healthy choices. I’ve seen this clearly with many clients I work with. This is where the practice of eating mindfully can be very beneficial. So finally, let’s talk about exactly HOW to eat mindfully. For starters, that means not eating in front of a newspaper, book, computer, TV or smart phone, which for most people (self included), is half the battle. After that, there are many approaches and techniques. I’ve read through dozens of online sources to see what the experts have to say and man oh man can they make something simple so very complicated! 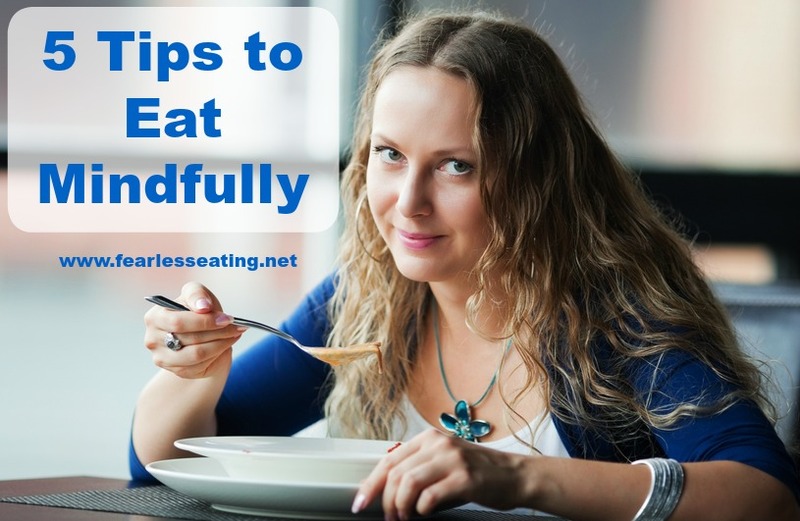 Here are what I think are the five most essential tips to eat mindfully. 1. Relax before each meal. Whether this means saying a prayer (like Grace) or taking five to ten deep breaths in preparation, our bodies digest our food better when we’re in a calm and relaxed state. Turn off all electronic devices and be sure to eat either in silence or have some relaxing music playing in the background. 2. Eat slowly and savor each bite. Pay attention to the taste and texture of the food. Notice the different flavors and chew slowly. Try to make each mouthful of food last 15-20 seconds. Alternatively, count each chew per bite of food. Strive for at least 30 chews before swallowing. 3. Eat only what’s on your plate. By eating slowly you’re less likely to reach for second servings. Make a commitment to eat only one plateful of food per meal. And of course, don’t overfill the plate! 4. Pay close attention to the feeling of fullness. As the meal progresses, notice how each bite makes you feel more and more full. Pay close attention to that fine line between feeling satiated and over eating. This occurs when your stomach is approximately three-quarters full. You will become more in tune with this over time, especially by following the first three steps. When the meal is over, sit for a while and relax. Give thanks for the nourishment, those who grew the food, delivered the food, prepared it for you and those with whom you shared your meal (even if it’s just yourself!). Start with these and you’ll surely be on your way to a healthier relationship with food whether you have a chronic digestive issue or not. And keep in mind that eating mindfully is not easy. It’s a practice so don’t get discouraged if after a few attempts, you don’t feel any benefit. Keep at it. And as I said, I’m not very good at it myself. So at the risk of being a hypocrite, I’m going to commit to a full week of mindful eating starting today. If you have additional thoughts or tips on this subject, please share in the comments below. Learn how this ancient, simple food is a much healthier and safer option than drugs like acid blockers and antacids. Includes 12 heartburn-busting recipes. Get it FREE today! 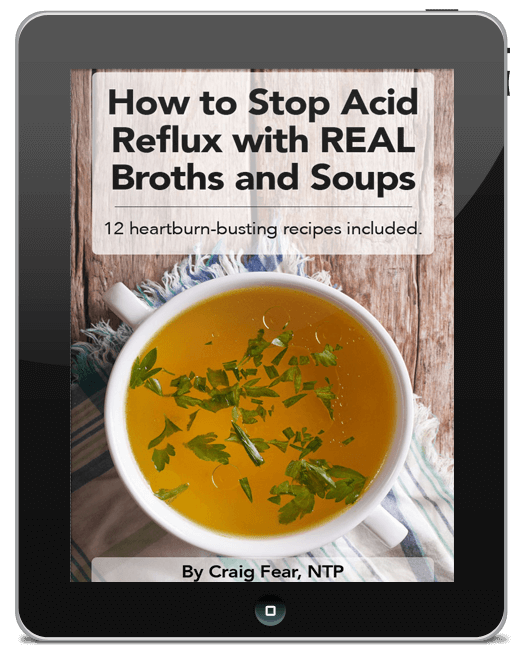 Craig Fear is the creator of Fearless Eating and the author of three books, The 30-Day Heartburn Solution, Fearless Broths and Soups and The Thai Soup Secret. After years helping clients with digestive issues, Craig decided to pursue writing full-time. He intends to write many more books on broths and soups from around the world! Click here to learn more about Craig. Just say NO to reflux drugs and start addressing the REAL cause once and for all! © 2018 by Fearless Eating. All rights reserved.